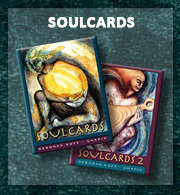 In the fall of 2000, I was impatiently waiting for the adoption of my son from Cambodia, when an energetic healer asked me to pull a card from a deck of SoulCards. When she saw the image on the card she told me to keep it. With a background the color of the ocean, the image has two women painted in a circular pattern like yin and yang; a white woman with strong hands is looking up expectantly, while an olive brown woman floats above her, one arm penetrating the other’s heart. 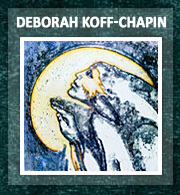 Soul Card #12 became my shrine, my ultrasound image. 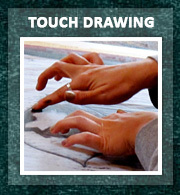 The image is like a womb, reminding me of my son’s birthmother and me in energetic embrace. 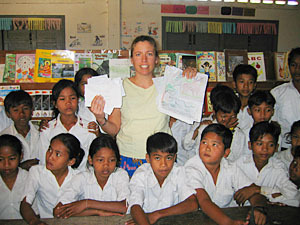 Over subsequent trips to Cambodia to visit a school we built in our son’s honor, I’ve always taken this card with me as a talisman, for protection. When I published Bones That Float, only one image felt right for the cover, Soul Card #12. 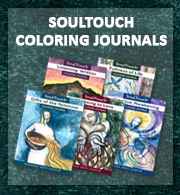 Connecting with Deborah Koff-Chapin and the Touch Drawing process became yet another magical moment in this soulful journey that crosses the boundaries of country and race to find the point where we all are One. 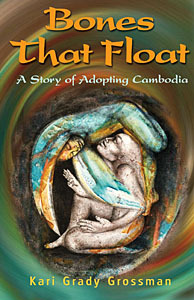 Thank you, Deborah, for this beautiful image that introduces my hope for love and healing in Cambodia to the world.